What Is Priority Mail International? USPS Priority Mail International is an expedited way to send mail and packages weighing up to 70 pounds to destinations around the world. Priority Mail International is faster than First Class Package International Service, with shipments generally arriving at their destinations within 6–10 days, and it can accommodate heavier parcels than First Class Package International Service as well. There are two pricing options for Priority Mail International-Flat Rate and retail pricing. The USPS offers a line of Flat Rate envelopes and boxes with pre-priced shipping rates between $24.55 and $61.30 to Canada, and starting at $30.60 and up to all other deliverable countries. With Flat Rate pricing, you don’t have to worry about paying more to send your item based on weight or distance. To use the Flat Rate packaging, you must ensure that your shipment fits inside the container and does not exceed the weight limit. Please note that the Large Flat Rate box can only hold up to 20 pounds, so if your package is heavier, you will need to use the retail pricing structure described below. When you ship using the Priority Mail International retail pricing rate, you’ll ship your items in your own box. The Priority Mail International retail pricing rate depends on the weight of your shipment, as well as the destination country. Oversized packages may be subject to a surcharge. Retail pricing starts at $34.30 and up to ship an item weighing one pound or less to Canada, and increases based on weight and distance. To use Priority Mail International, prepare your letters, flats and packages as you would for domestic mail. This means that your return address—including the country—should go in the upper left corner, with the recipient’s address in the center. Before sending your package, you will need to make sure that the contents you are mailing are acceptable to send to the recipient’s country. A complete list of restrictions can be found online using the USPS International Mail Manual. You will also need to weigh your shipment in order to ensure that Flat Rate packages do not exceed the specified weight limit, or to calculate the retail shipping rate. 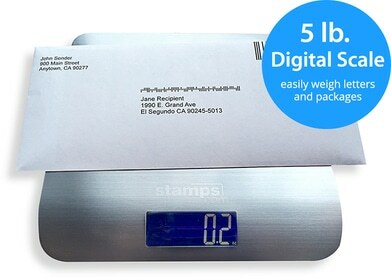 If you are a Stamps.com customer, the software will automatically perform the rate calculation based on package size and delivery destination. If you are sending an envelope or package that weighs more than one pound, you will need to fill out a customs form, which asks you to describe the contents and value of the package and indicate whether it is a gift or merchandise. You can obtain custom forms from your local post office and fill them out by hand. If you use Stamps.com, the software will automatically fill out your customs forms for you. Priority Mail International shipments can be handed to your carrier, dropped off or brought to your local post office. Free carrier pickup is available for this service, which means that you can arrange to have your package picked up from your home or office—as long as you've attached the pre-paid shipping label and applicable customs form. Stamps.com is the convenient and affordable choice for sending shipments using Priority Mail International. Stamps.com customers automatically get up to a 5% discount off the price of their Priority Mail International shipments, and they can print postage, address labels and customs forms in one easy step. Additionally, Stamps.com eliminates the need to travel to the post office to obtain customs forms—you can quickly print customs forms directly through the Stamps.com interface. Tracking is available for all Priority Mail International shipments except Flat Rate envelopes and Small Flat Rate boxes from within the Stamps.com software application. You can even consult the International Mail Manual right from the Stamps.com interface to avoid costly mistakes that could result in customs delays or even confiscations.